%FcTempPath% - saves the current FreeCommander TEMP path. FileListMouseWheelScrollMultiplier=1 - change mouse scrolling "speed"
SelectLeftClickOnIcon works only if you click on file/folder icon. SelectLeftClickOnEmptyCaption works only if you click on empty area of the caption. If no empty area exists, then it works by click on extension or on right edge of the caption (ca. 20 pixels). If you click and then move the mouse, you can select more items. These options are interesting if someone use "Open file/folder with single click". With SelectLeftClickOnEmptyCaption=2 it is possible - I think always (NC-Mode, Windows-Mode, Windows-Colors, User-Colors) to select the items with mouse dragging. ThumbsNoClipCaption=1 - draws caption without clipping; the user must self increase Y spacing. NewFolderNameSuggestionList=A1|A2|A3;B1|B2|B3 - if you want to expand the list of suggested names for the folders in the "New folder" dialog. DirMonChangeInterval=1000 , to increase the auto-refresh interval and decrease the CPU load. 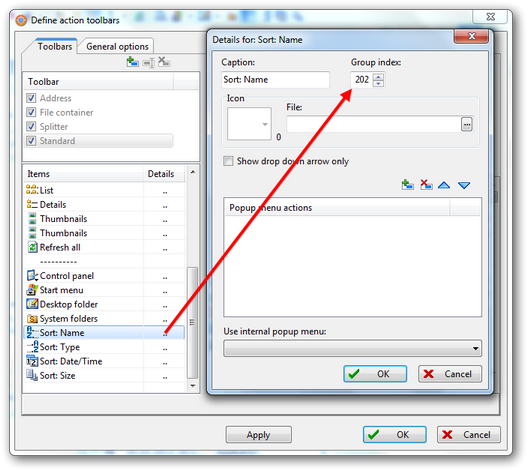 RightClickEmptySpaceFcMenu=0 - if you like to show the default windows context menu on free space right click. GoUpFromDriveEnabled=x - default value is 1 (true). Set the value to 0 if you do not want go to parent from the drive root. 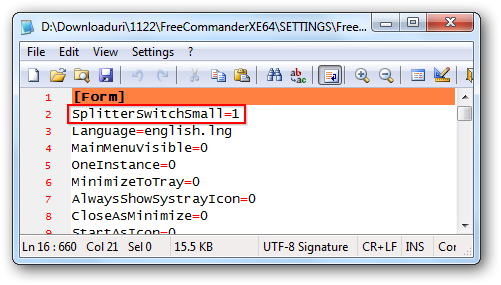 OpenItemsWarningItemsCount=2 (default value 2). If you do not like the warning message for opening of multiple files, then increase the value (*implemented in build 702 - not public at the time of this writing). CopyFullPath_AddLastDelimiter=0 - set the value to 1 if you want to add trailing backslash if copy folder paths to clipboard (*implemented in build 727 - not public at the time of this writing). Shift+Tab shortcut switches focus between (opened) Tree, Favorites tree and Active/single panel. Tab key switches focus between the 2 panels. Middle-click on a folder opens it in a new tab in the same panel. Ctrl+Middle click opens it in the opposite panel. Middle click on a Tab closes it. Shift+Ctrl+T (default) reopens last closed tab. Double click on empty space in the Tab bar duplicates the current Tab. 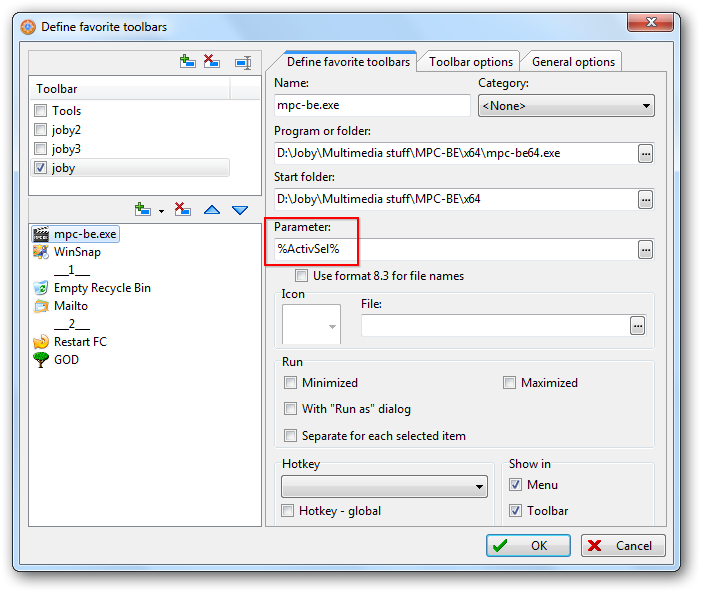 Press ALT key and drag your favorite file/folder/program on desired place in the favorite toolbar. Hit F7 (default for create new folder) and write a\b\c creates folder a with subfolder b and sub-subfolder c in the active panel. Hit F7 and write a|b|c creates 3 folders a, b and c in the active panel (you can combine \ and | signs; e.g. a\b|a\c creates folder a with two subfolders, b and c). Starting with build 687: Implemented new option to define in the freecommander.ini in the Section [dlgInputBox]: AutoComplete=0. With AutoComplete=1 will be auto completion activated in e.g. "Go to folder", "New folder" dialogs. Starting with build 702 (donor version at the time of this writing): Implemented Right click with the pressed Ctrl key changes the meaning of the option RightClickEmptySpaceFcMenu (gives the option to show standard Windows context menu). Issue: The action toolbar buttons for Name, Date, Size only work "once" i.e. they will sort but when you click them a second time the sort is not reversed. 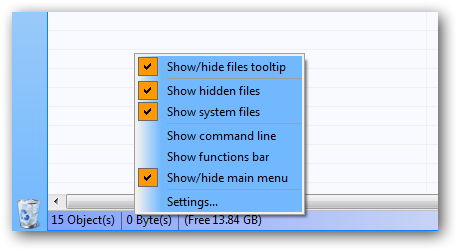 Solve: Open "Details for a toolbar item" http://www.freecommander.com/fchelpxe/e ... lbars.html and change the "Group index" for each button to unique value. Use values > 200. Issue: Quick viewer does not occupy the entire real estate of the opposite panel (folder tabs are still visible), no matter how high you drag the toolbar. Solve: open your FreeCommander.ini settings file and edit these 2 lines in the [MainPanel] section, using "98" as a value (I think it's %) or "94" if you still want to see the title bar (you may want to play around with these values, depending on your screen size and resolution and also on the number of XE toolbars displayed). Disclaimer: some of these settings might change over time (some already changed or have been incorporated into the Settings GUI). Note: Please add, suggest, validate or invalidate them (and keep the off-topic to a minimum)! Thank you, everyone, for making this thread possible! Last edited by joby_toss on 13.08.2016, 19:45, edited 19 times in total. - Implemented: Option 'ThumbsNoClipCaption' to define in the [Form] section. The value 1 draws caption without clipping. The user must self increase Y spacing. In case you didn't remark, also you can drag and drop selected files into the exe file in your favorite toolbar. In this case, the parameter for that exe file is ignored (let's say you put %ActiveDir%), instead of parameter (%ActiveDir% in this example) there are the selected files that are taken as command line parameters. Drag and drop works also for favorite items (ALT+F). Can you make this option available for the New text file dialog, please!? 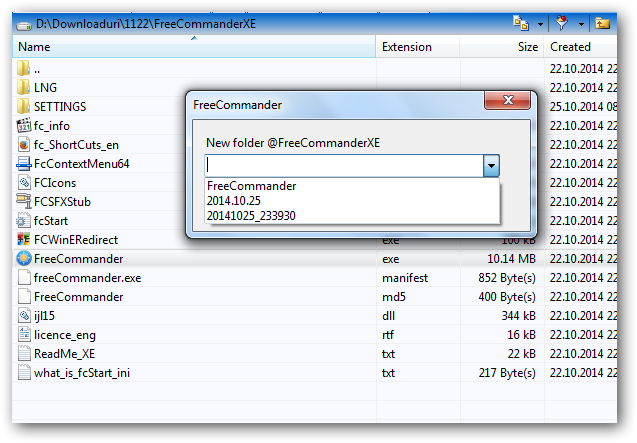 When I insert "NewFolderNameSuggestionList=A1|A2|A3;B1|B2|B3" in file "Freecommander.ini" after restart this line disapears from "[form]"
I use the portable version 681. Make sure you're changing the .ini file (open/edit/save/close) while FC is not running. joby_toss wrote: Make sure you're changing the .ini file (open/edit/save/close) while FC is not running. I agree. Thank you very much for your work with this topic and for the help in the forum, joby_toss! BTW - I found the way how to easily remove diacritical marks from files (most/all characters), it's useful for old CD/DVD players that can't read the files with diacritical marks. Characters are from wiki, perhaps not all characters are included, please test, later it could be added to the first post of this topic. The spaces between characters are included just to not make this topic too wide, you can remove those two characters "| ", but it will work also without removing them. Then save it as Profile. Perhaps it should be added to default settings, together with some other profiles for mp3 files ([mp3artist] - [mp3title]), jpg files ([exif_taken]), basic counter ([c] - digits: 4)... This way also normal users would learn easily how to use Multi rename. Can anyone give me a confirmation on the fix, please? - Implemented: New option to define in the freecommander.ini in the Section [dlgInputBox]: AutoComplete=0. With AutoComplete=1 will be auto completion activated in e.g. "Go to folder", "New folder" dialogs. - Implemented: new option "GoUpFromDriveEnabled"; default value is 1 (true). Set the value to 0 if you do not want go to parent from the drive root. Is there a setting in FC.ini which allow to load FC in Full Screen mode (like after pressing F11) or a setting allowing to load FC without title bar?